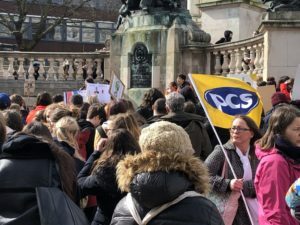 Hundreds gathered in Liverpool’s Derby Square to demand an end to what they claim is the ‘poverty pay’ of cleaners working for International Service System (ISS). The protesters called for a new £10 an hour living wage for all of those working on ISS contracts locally, including holiday and occupational sick-pay that is on par with civil servants. Friday’s demonstration was inspired when the firm failed to comply with the Public and Commercial Services (PCS) Union’s calls for better conditions for all workers on ISS contracts awarded by HMRC. Only one month ago, a cleaner working at Top Shop’s flagship store on Oxford Street won £75,000 in compensation after she was fired over her protest to earn the London living wage. Assistant General Secretary of the PCS, Chris Baugh, said: “This isn’t an isolated dispute. PCS and many other unions have been involved in trying to organise some of the most exploited workers in precarious employment, often with the worst conditions. “I think the trade union movement, and PCS as well, have an obligation to organise these workers to ensure that people have a living wage, decent conditions and the right to be represented by a union. “It would be lovely to think you could rely on the benevolence of the employer and the government, but we’re all grown up here and we know that will never be achieved without a necessary campaign, the necessary protest and, if necessary, industrial action. The PCS union says ISS is still yet to respond to its demands. JMU Journalism attempted to contact ISS for comment but did not receive a response.